» ESRI's ArcExplorer is a lightweight, no-cost GIS data viewer. Note that the .NET version of ArcExplorer is significantly different from the Java edition. » The Distributed Energy journal has posted an news entry on the National Geothermal Data System project: "State Geological Surveys to Play Key Role in Geothermal Energy Search"
» This is an example Python script that showcases GeoNetwork authentication, session handling, and CSW transactions. 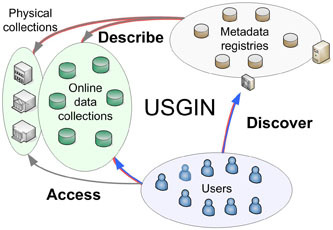 » This section contains tips and helpful hints for using the USGIN EC2 Instance.